A third of the way on the bus, however, my instinctive sense of direction took over. “We just passed a sign that said Garden of Minerva,” I said to Carol. We hopped off at the next stop. “This is not the stop on the map,” Carol noted with a slight tone of resignation. And indeed, within a couple of blocks, we were profoundly lost, Carol struggling to even locate our whereabouts on the map. The experience, though, provided a teachable moment, in that street signage for automobiles does not necessarily coincide with directions for pedestrians, especially when that signage is directing traffic away from where only pedestrians might tread. Now this is an infestation! 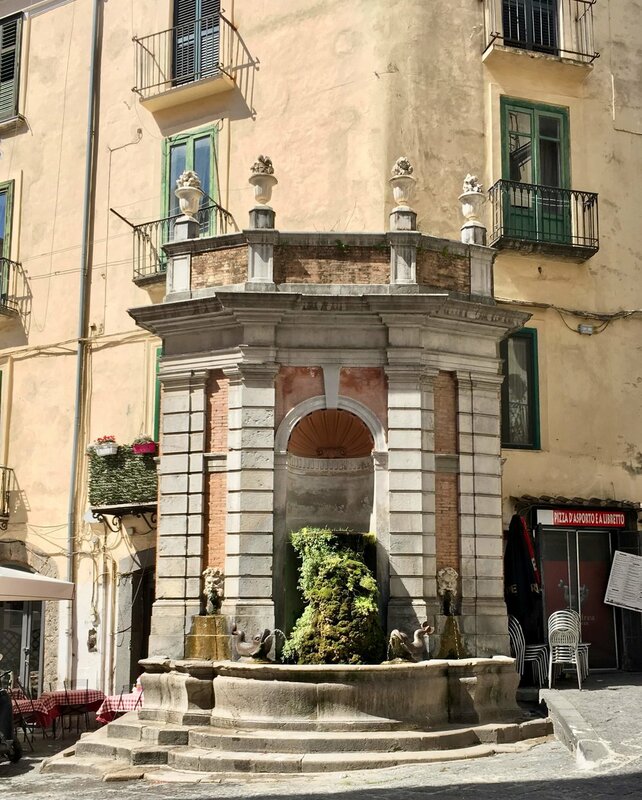 Yet, in the true spirit of the flaneur, my getting us lost led to stumbling upon Salerno’s old city, which even Carol’s research had not revealed to her. The look I got, when I pointed this out to Carol, suggested I should not make too much of that salient. We were still utterly lost, and Carol had taken to ignoring the directional signs to Minerva we were still passing by, choosing to follow the map which continued to set us off 180 degrees opposite those street signs. The map led us directly to the elevator, after a wonderful walk through the crooked streets and alleys of the old city. Arriving later than we would have had we stayed on the bus had the unintended consequence of our arrival at the Garden of Minerva coinciding with apparently multiple class trips of post-millennial larvae that plugged the stairways and paths through the garden like a plague of frogs. Carol noted the sheer joy plastered on my face like the graffiti in Naples, and steered me to a secluded corner of the garden where I could assume the posture of the garden’s stone statuary. My reward from Carol for maintaining my composure and not pushing a couple of the more boisterous kids over the garden’s retaining walls, was an early start to Friday’s Happy Hour along Salerno’s waterfront promenade. My reward from the travel gods for not creating an International Incident was to have us stumble upon the start of the city’s chocolate festival, something I’d always considered a figment of my fevered imagination. But there it was: stall after stall of piles of chocolate confections of every shape and description. Our purchases included a second love lock, made entirely of semi-sweet chocolate, and which we later lovingly attached to our alimentary canals. Carol did admit that blindly bumbling and stumbling about has its ups to balance its downs, and I reaffirmed that my instinctive sense of direction must always be challenged.